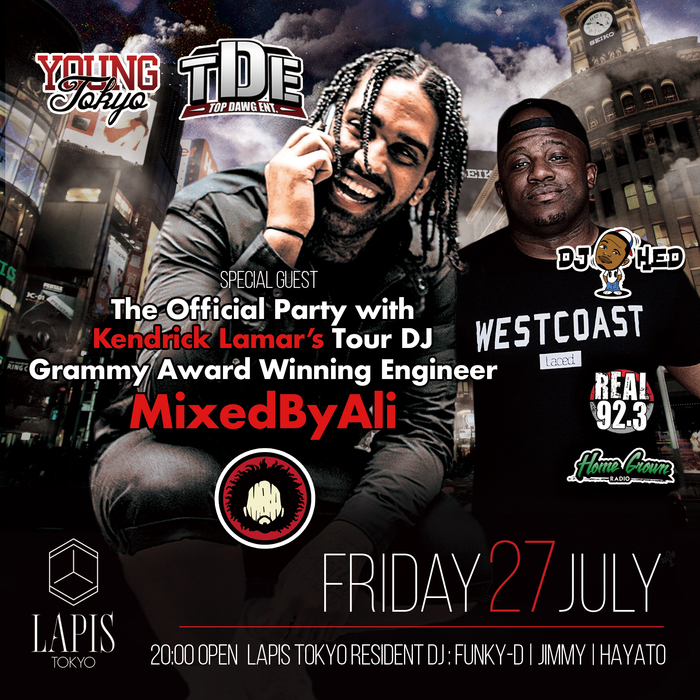 4-time Grammy Award winner (Best Mixer/Engineer Category) and Kendrick Lamar’s official tour DJ ‘MixedByAli’ will be performing at LAPIS TOKYO for one night only. This Top Dawg Ent. engineer has worked with artists such as Schoolboy Q, Lil Wayne and will.i.am, as a mixer for their songs. Additionally ‘DJ HED’ – cohost of HomeGrown Radio on Real92.3, the No.1 Hip Hop show on iHeartRadio – will be making an appearance as well. It was during one of his shows that Kendrick Lamar famously announced the change of his stage name from ‘K Dot’ to his current name. Don’t miss the chance to see this exclusive event on Friday July 27th. *LAPIS TOKYO also offers a cup of free ice cream for all women upon entry.